Travis Kelce and Rob Gronkowski are often compared. As two of the best at their tight end position, their rankings and statistics are very similar. While their numbers may be alike, Kelce doesn’t see himself as another version of Gronk. We’ll get to see the two tight ends in action when they face off in a Sunday Night Football matchup this coming weekend. The 5-0 Kansas City Chiefs head to Gillette Stadium for a game with the 3-2 New England Patriots. Other than being moved around in formation, Kelce said he doesn’t see where he and Gronk are alike. 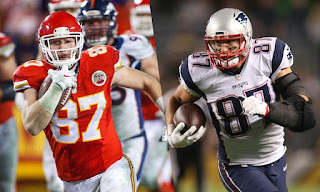 The respect is mutual between the two, as Gronk spoke highly of Kelce on Monday’s Sirius XM NFL Radio interview with Bruce Murray and Brady Quinn. While Kelce and the Chiefs are 2-0 in the regular season against Gronk, the Patriots’ tight end has the playoff advantage. New England defeated Kansas City in the 2015 playoffs and Gronkowski has been part of two Super Bowl-winning teams.